Hi everyone! 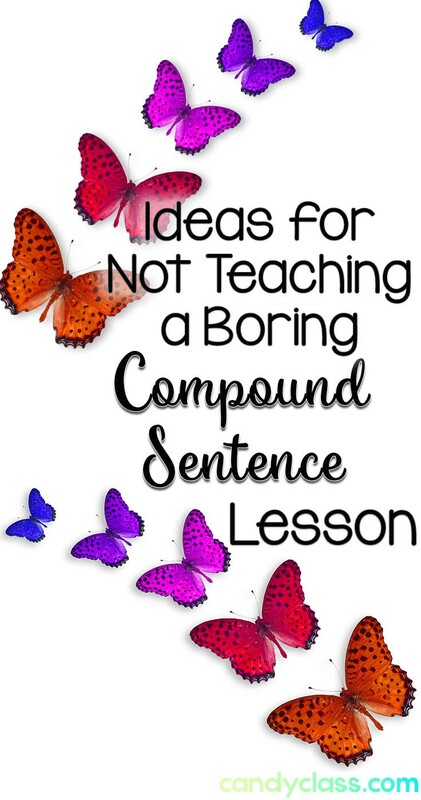 Today, I wanted to share some ideas about teaching compound sentences. First off, students need to know those fanboys before diving into the realm of compound sentences. A simple way to do this with a hands-on twist is to have them make some fans with those bad boys. Students simply fold the paper seven times to make eight sections. Than they write the coordinating conjunctions on the fan, squeeze it, and make a breeze. Idea #1 Silly Sentences- Write some simple sentences and the fanboys on some sentence stripes. Students connect the two simple sentences with one of the fanboys. Then they use pasta and lentils to add the punctuation. Finally, they add that capital letter at the beginning with a wikki stick or other letter manipulative of choice. 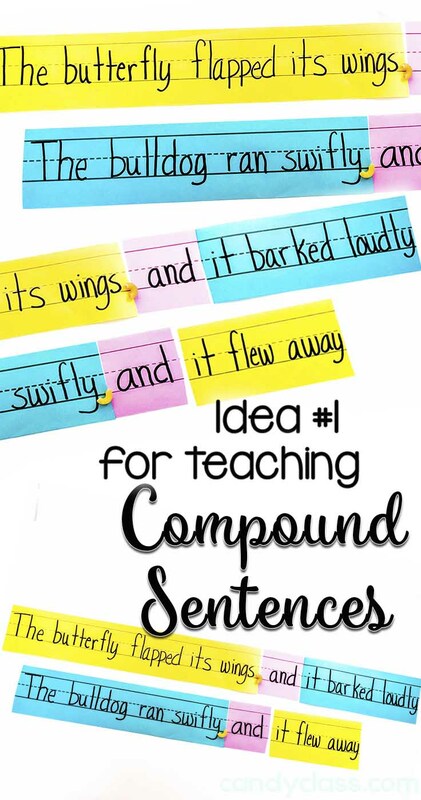 Idea #2 Create & Share Giggly Sentences- Each student creates their own simple sentence (silliness encouraged). Then they partner with someone else to form a compound sentence with their two simple sentences. They can record their newly formed sentences on a paper. After a few minutes, they rotate to pair up with another student and make another sentence. You can rotate as many times as you like. 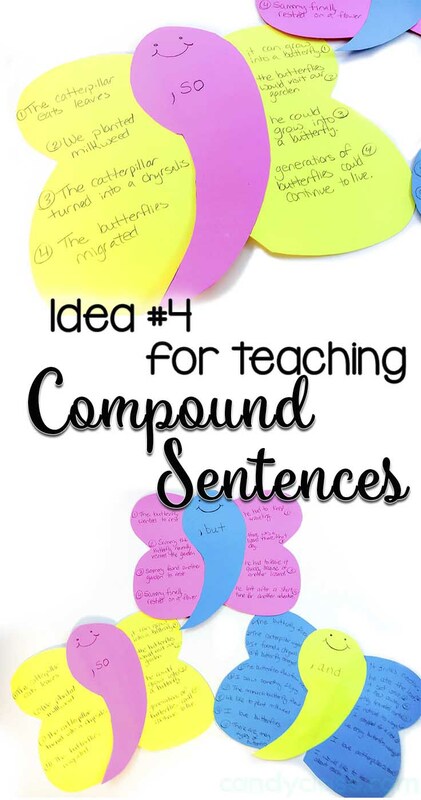 Idea #3 Work with Compound Sentences in Multiple Ways- Students can identify if a sentence is simple or compound, rewrite two simple sentences into a compound sentence, add more details to a compound sentence, and rearrange compound sentences into other sentence formats. Click here for these task cards or check out the digital ones here. 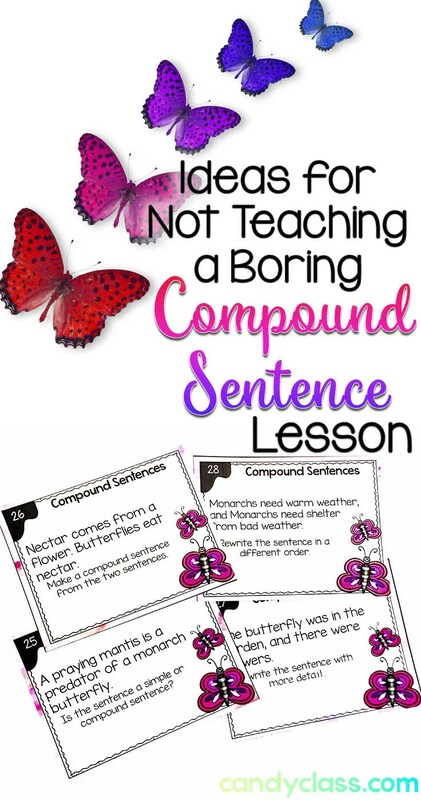 Idea #4 Butterfly Grammar Craft- Add simple sentences on each wing of a butterfly. Then the comma and fanboy can be added on the body of the butterfly to join the two simple sentences into one. I added a touch to this craft idea by making the butterflies body in the shape of a comma, but you can use any butterfly template or make your own easily for this craft. All I did was cut these out of some colored card stock. You could also use colored construction paper. 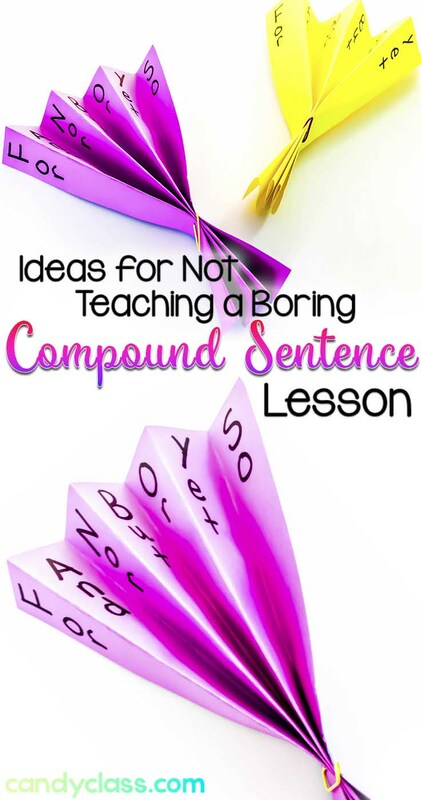 I hope you enjoyed these ideas about compound sentences. Check out some of my other grammar posts, and make sure to subscribe to email for more ideas! I promise I don’t spam. In fact, if I can blog once a month, I am doing good, lol! Although, hoping to share more with you all (nothing crazy…never going to be blogging 365, ok!). Thanks so much for stopping by the Candy Class! 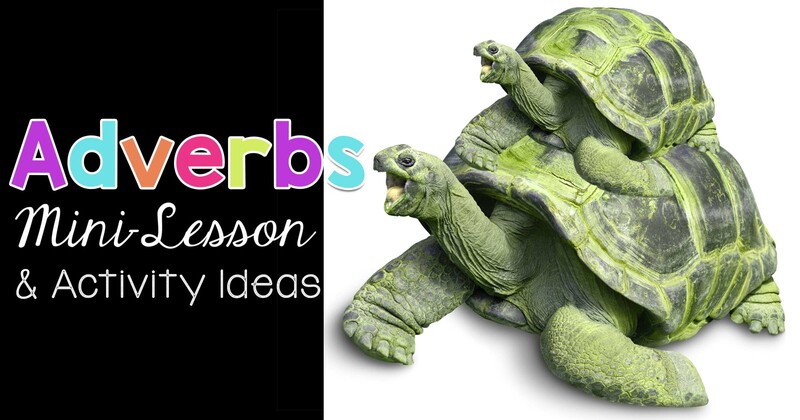 I hope you are enjoying my grammar posts and getting lots of ideas to jazz up your lessons. 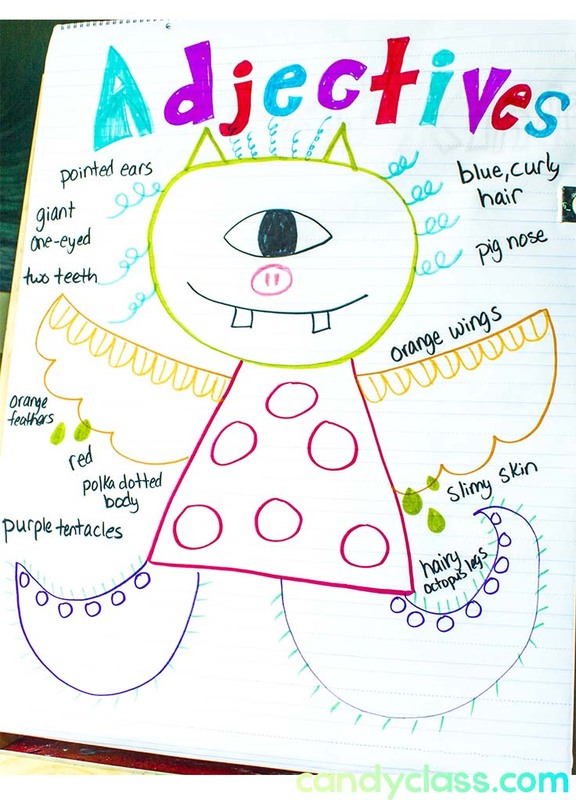 Idea #1: Create an Adjective Monster- If you got a smudge of art talent or you just don’t care about art perfection on anchor charts like me, you can have each student use one adjective and a noun to describe what the monster will look like. You then either draw or add the monster parts as you go along. Don’t forget to write those amazing adjectives around your monster! 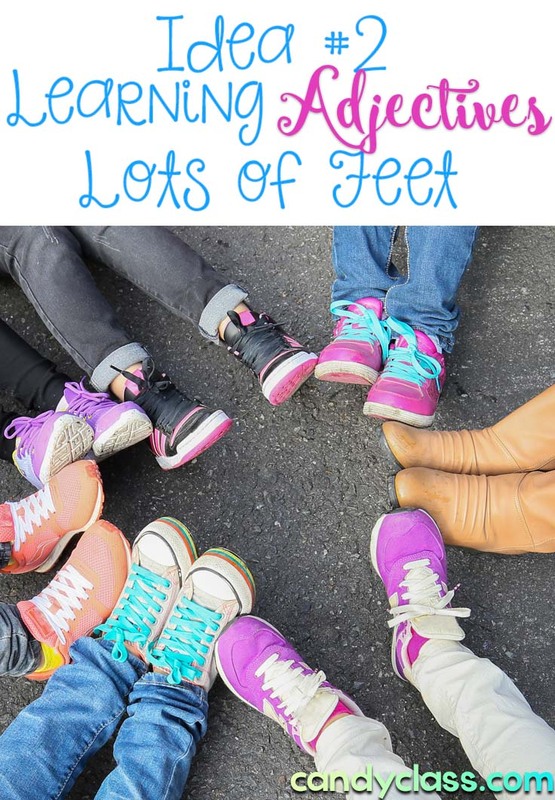 Idea #2: Lots of Feet- Students can look around at the feet in the classroom to generate a list of adjectives. Don’t forget to encourage the adjectives for which feet? Those feet. 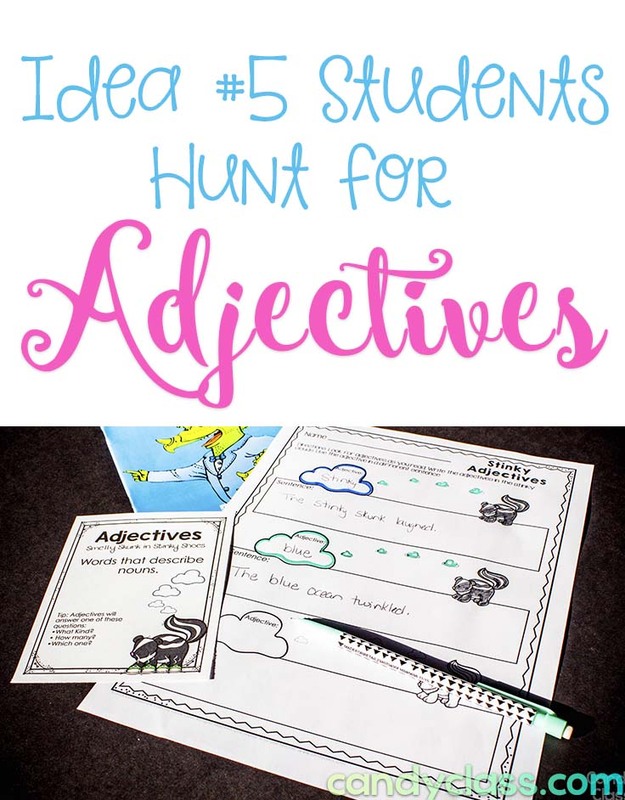 Idea #3: Brainstorming Adjectives- Make three anchor charts each. Give each student a marker. Divide the class in groups. You may want to have some groups sit out while three groups work on the posters at the time to tame the chaos and make room for everybody. Each group will write as many adjectives as they can think of to answer those questions. After a minute, you rotate the groups. Alternatively, you can have charts up for smell, taste, looks, quantity, etc. 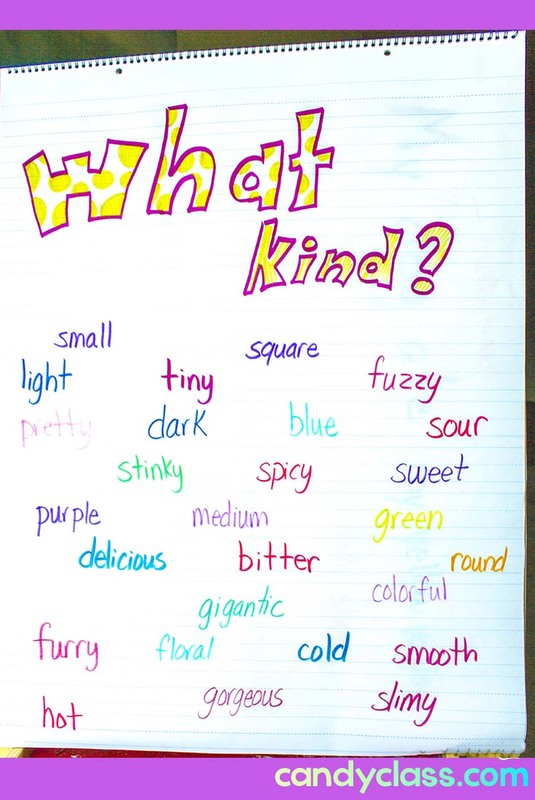 Idea #4: Sprinkle Adjectives in Your Writing- Have many adjectives written on paper that is shaped and colored like sprinkles. 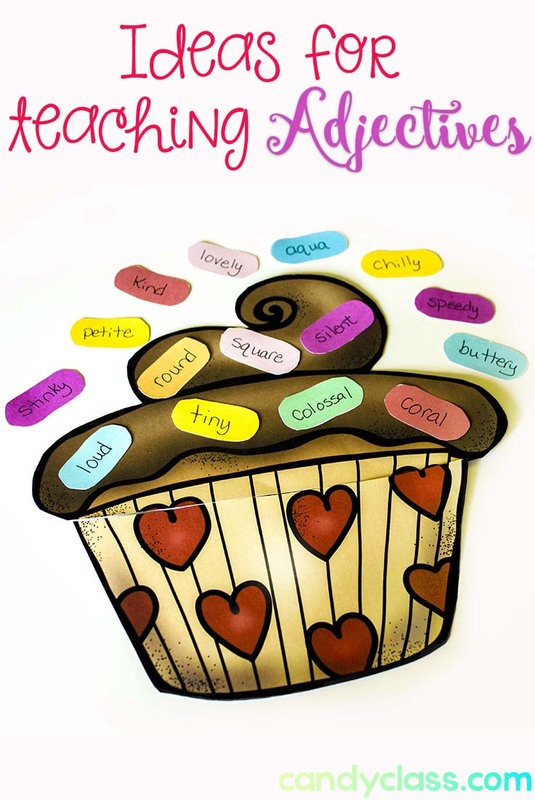 Students can use these as reference to sprinkle adjectives in their writing as they edit. It’s good to remind them to look for nouns that have no sprinkles. Now actually, the cupcake was just added in the picture for fun. Just having the “sprinkles” handy is all that is needed for the activity, but I could not resist adding a cupcake to it, lol! Cupcakes are always optional though ;). You can actually write the words on color paper and just cut them out in this shape. I recommend laminating them. Idea #5: Word Hunt in a Book- Students can keep a handy writing pad to record adjectives they find as they read. I’ve used these printables, but you can totally put it in a notebook too. Idea #6: Word Hunt Sorting- This goes with the idea above about finding adjectives as they read, except they take it a step further by sorting the word into a category. The categories can be either the questions, What kind? How many? Which one? Alternatively, the categories can be smell, look, taste, quantity, touch, etc. Idea #7: What’s in the Box? This can be done a few different ways. 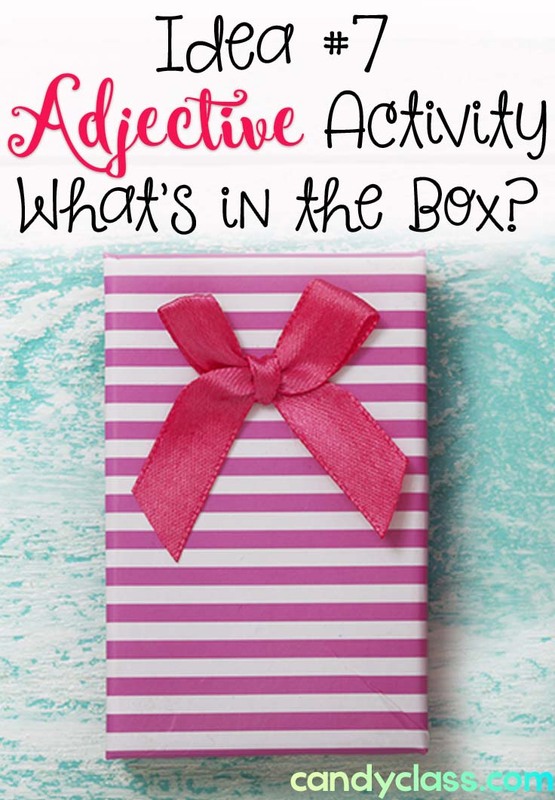 You can place something in a box and describe it to the classroom with adjectives. Students will have to guess what is in the box. Alternatively, you can have numbered boxes (or bags) with objects inside with a card in front that describes the object inside it. Students will have to write down their answers as they rotate from box to box (or bag to bag). At the end, students share their answers as a class. You then reveal what was inside each box (or bag). 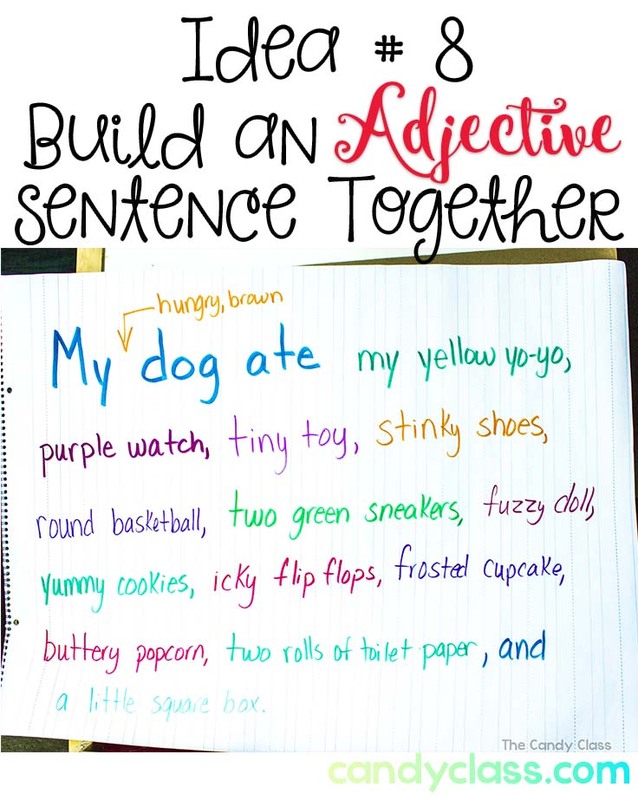 Idea #8: Build a Sentence Together: You start with a bland sentence like, “My dog ate.” Students each take turns adding an adjective to the sentence. You can add some more nouns in there if needed, of course. Together, you build a descriptive sentence as a class. 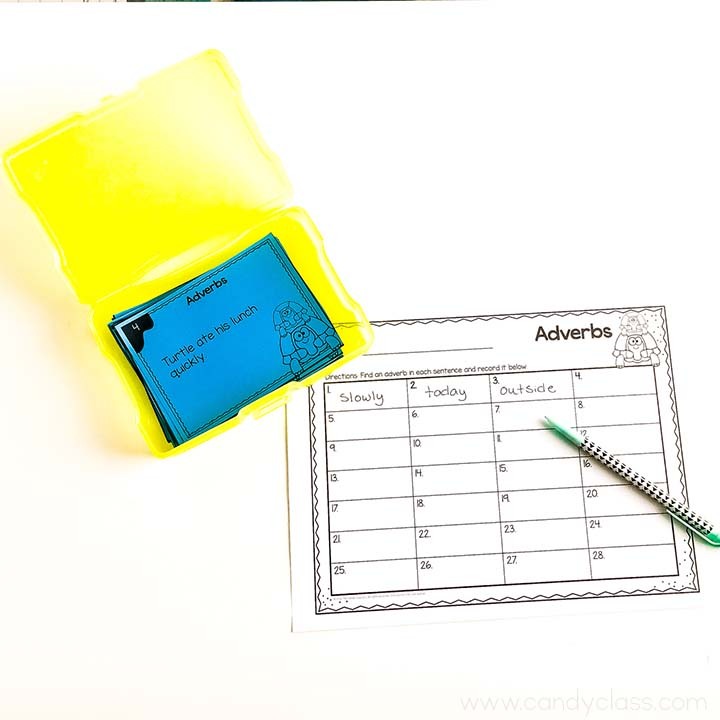 Idea #9: Adjective Round Up: This is an adjective game you play with the class. Students are given a few minutes to list as many adjectives as they can on a sheet of paper (you could even have them lists adjectives to describe a noun of your choice). After time is up, they pair up with a student to compare the lists. They must mark off any adjectives that are the same. They then switch to another partner to compare lists. Once again, they mark off any adjective that is the same. You can have them switch as much as you like. At the end, the person with the most adjectives remaining wins. Idea #10: Empty Noun Hunt: As students are reading, they look for nouns with no descriptions. They rewrite the sentence with some adjectives. 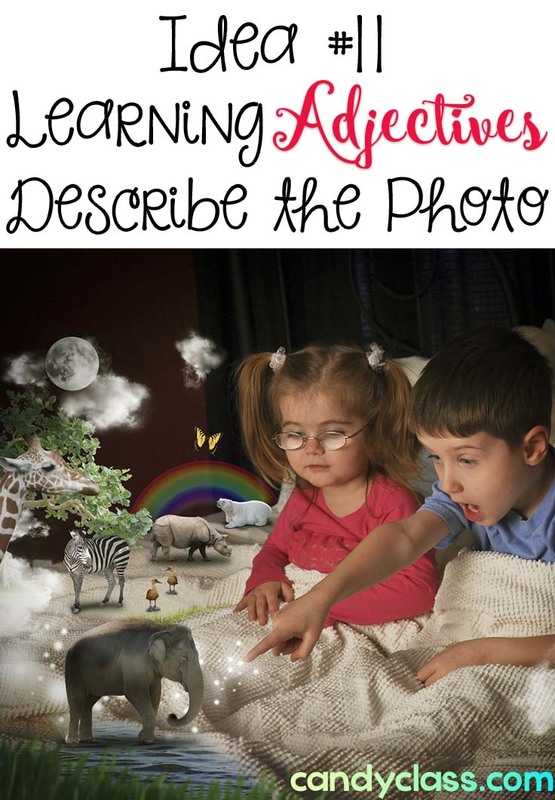 Idea #11: Describe a Picture: Students describe what’s in the picture with adjectives. You can do this as a whole group instruction and record their answers on a board if you like. I like the idea of using something whimsical like this picture below. 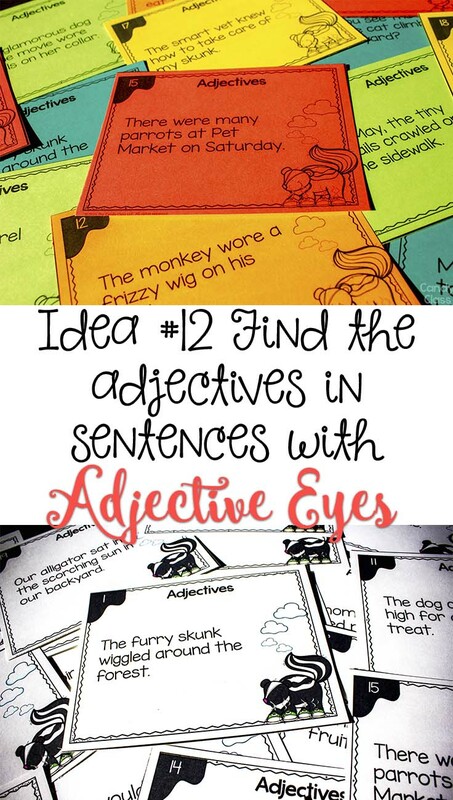 Idea #12: Adjective Eyes: You share some sentences with the classroom. Students look for the adjectives in the sentence. Alternatively, task cards with sentences can be used in a center. You can make these fun by adding some fun glasses for looking or use a pointer with big eyeballs. 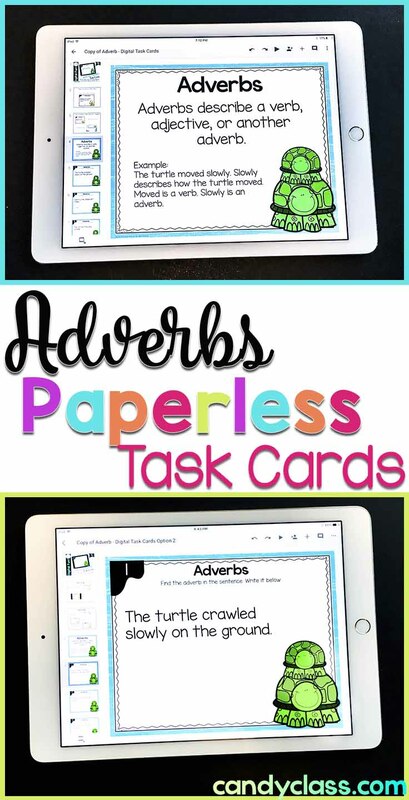 Find these task cards here. 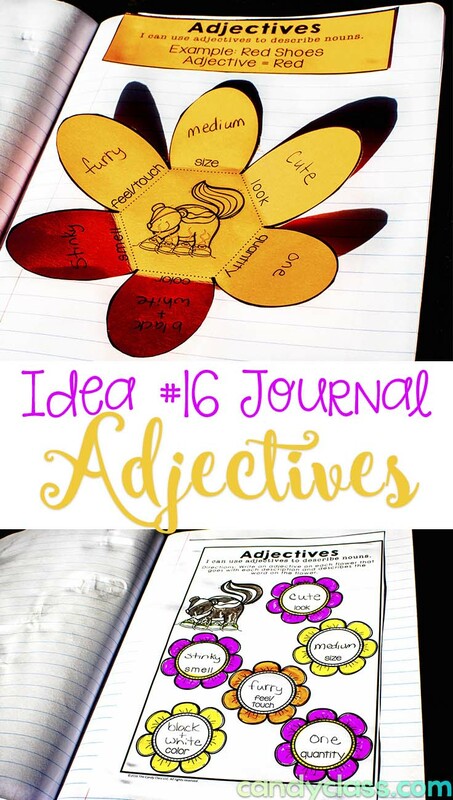 I also have them in my Everything You Need to Teach Adjectives unit. 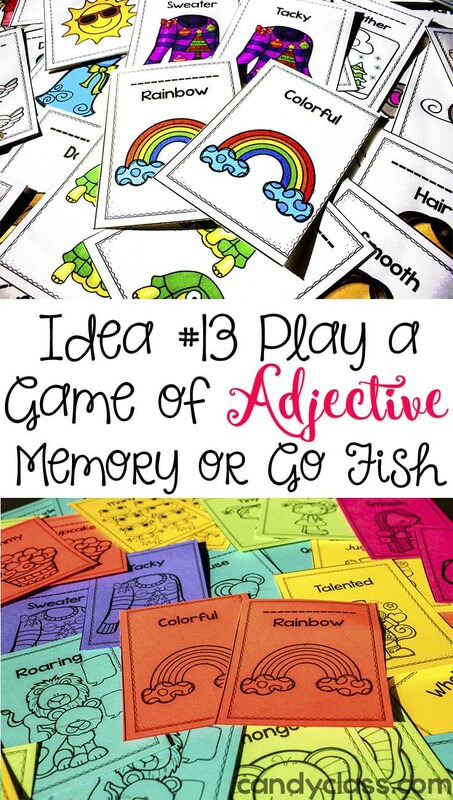 Idea #13: Adjective Games: I like to use games in centers for students to have more hands-on time with adjectives. 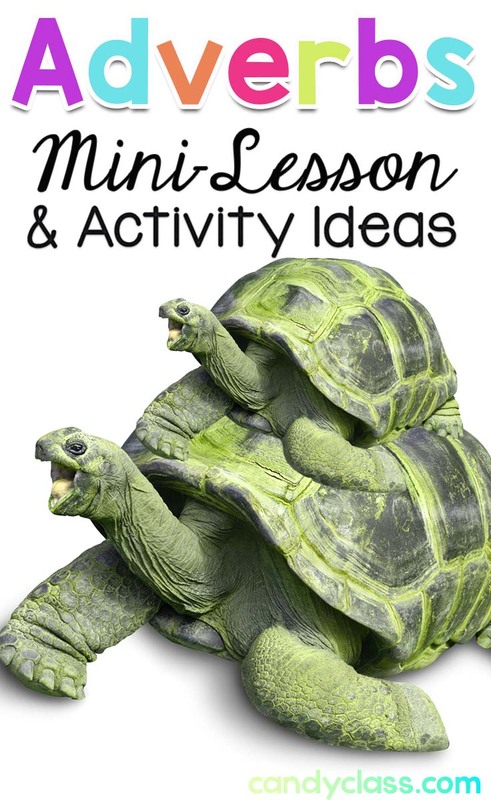 For students who need a bit more help, I like a game of memory, cover up activities, and graphing activities. Once they get the hang of identifying adjectives, I definitely want to move them up with their critical thinking, so I incorporate using adjectives in sentences too. I’ve even figured out a way to have them use adjectives in a game of bingo! I don’t have a picture here, but I have a race with sentence making that goes with the spinners too. There is three different spinners, and I have seven activities I use with those three spinners. I am all about repurposing a game board for another activity. 😉 Of course, you can always put some adjectives on some index cards and make some memory and gold fish games. Find the spinner games here. 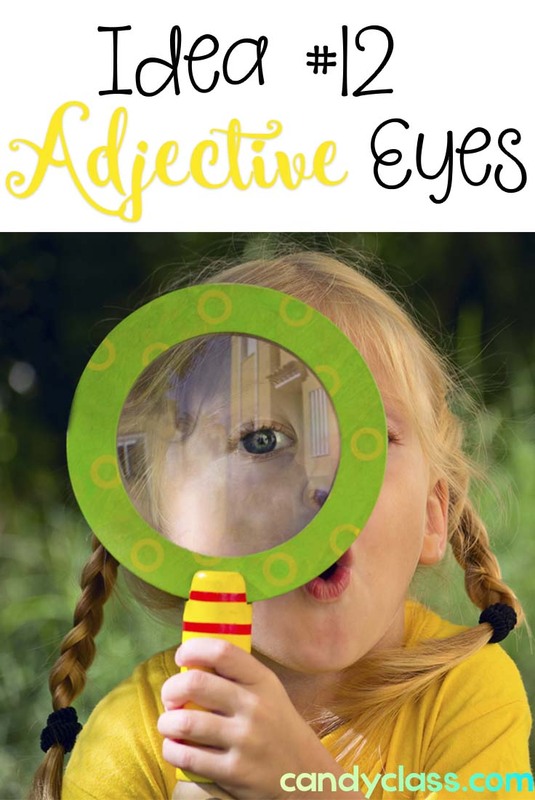 I also have them in my Everything You Need to Teach Adjectives unit. Find these game cards here. 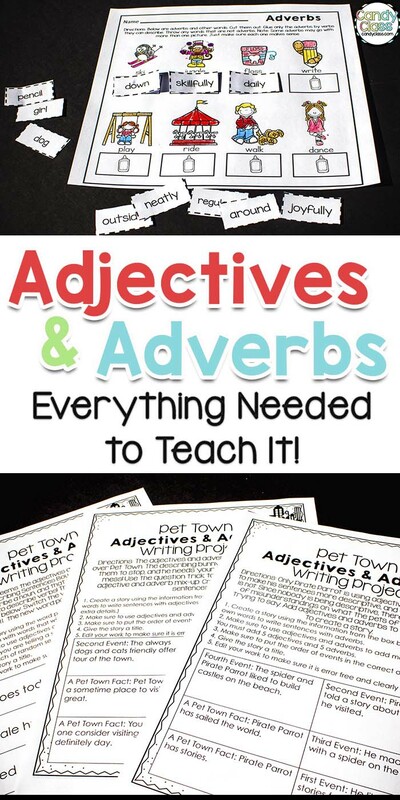 I also have them in my Everything You Need to Teach Adjectives unit. Idea #14: Printables are OK. Sometimes, you just need a printable. I totally get that. I like to use no prep printables that still incorporate some fun like dabbing, and I like printables that have students applying things too. I also like to integrate reading comprehension. 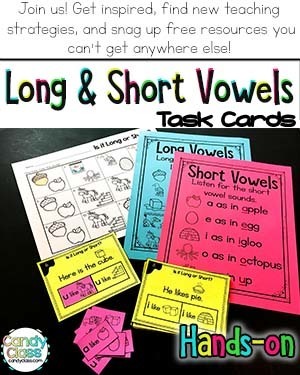 Find these no prep printables and many other resources by clicking here. 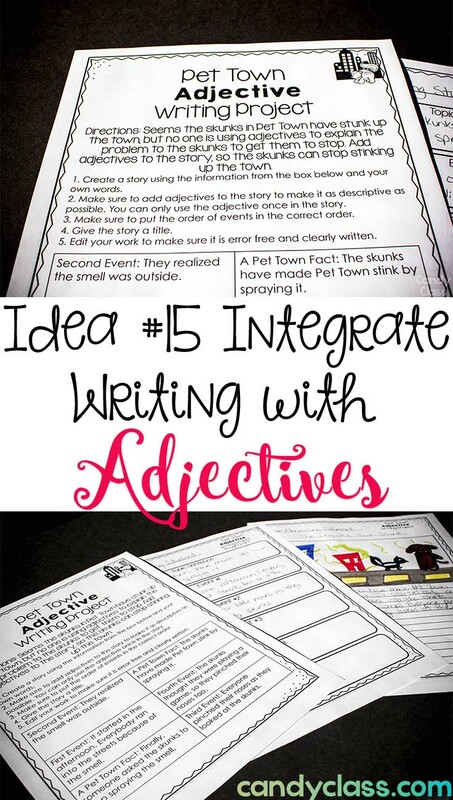 Idea #15: Integrate Writing: For me, the main reason a student should know about adjectives is not so they can diagram a sentence, but so they can use those adjectives! Sure diagraming a sentence is important, but that is not the ultimate goal. 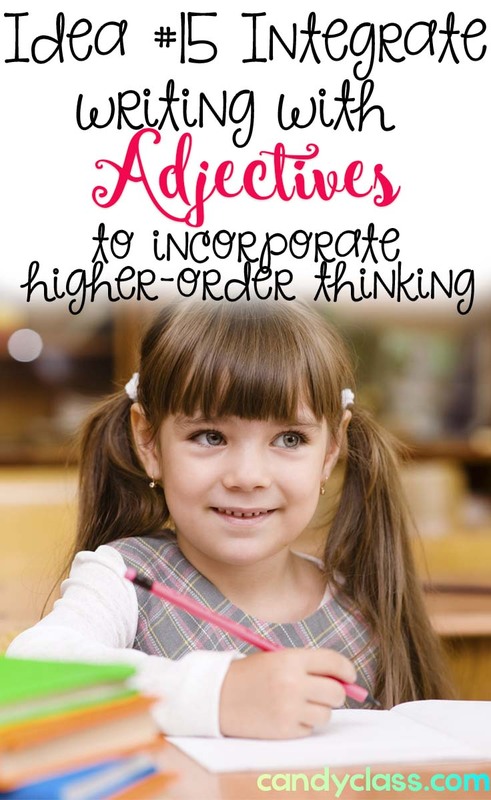 I think it is important for students to tap those higher thinking skills too, so incorporating a writing activity with the integration of adjectives is a great way for students to use those more creative thinking skills to synthesize what they know into something new as they use those adjectives. 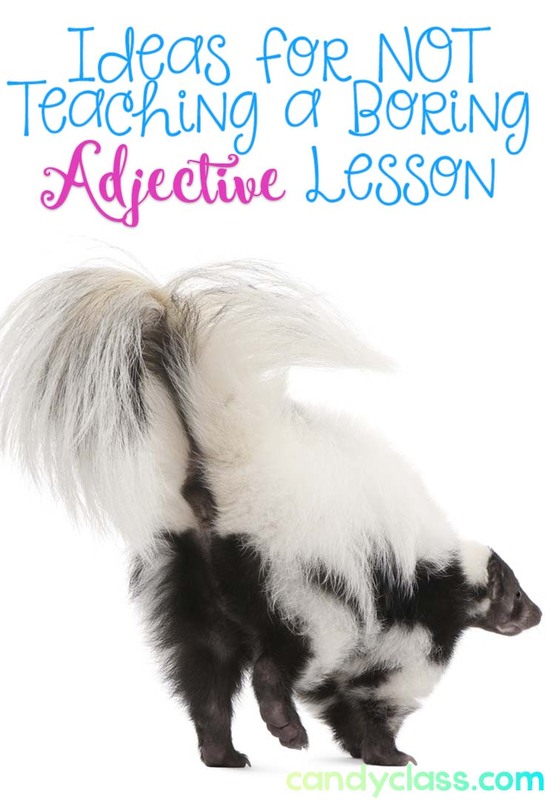 Find this writing activity that incorporates higher order thinking and many other resources in my Everything You Need to Teach Adjectives unit by clicking here. 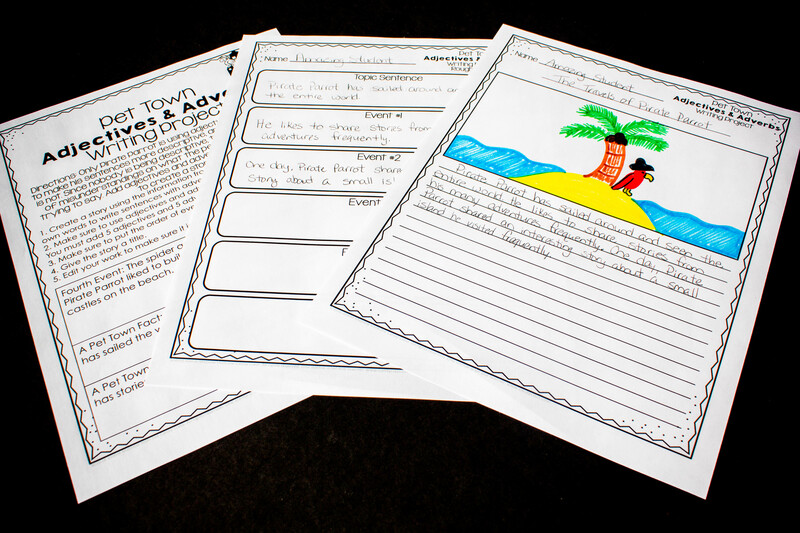 Idea #16: Journal It: I like the idea of students keeping a journal because students can revisit their journals. There are multiple ways to keep a journal. 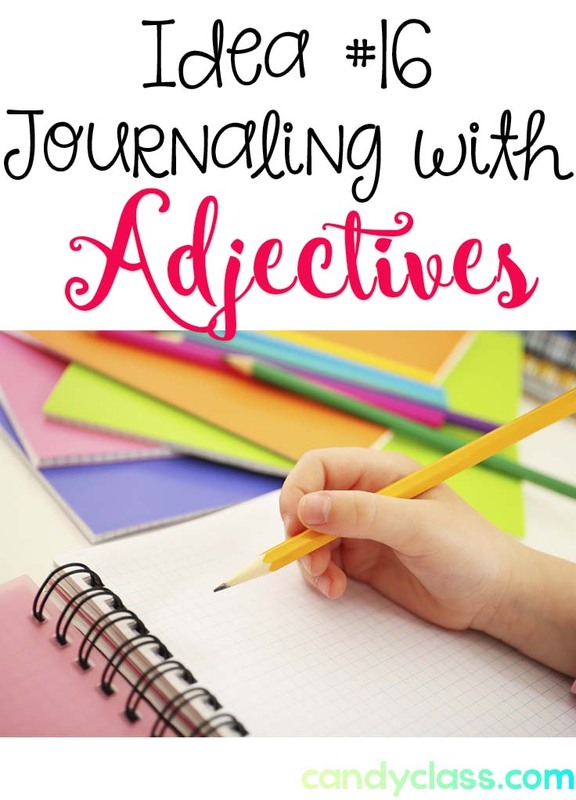 Find the interactive notebook entry, journal entry, and many other resources in my Everything You Need to Teach Adjectives unit by clicking here. I hope you enjoyed these ideas! I have many other grammar and vocabulary posts in the work, so make sure to subscribe for email to get more ideas!